These two new mobile platforms are the direct successors of the existing Snapdragon 626 and 653. They both use the 14 nm technology and come with Bluetooth 5, Quick Charge 4.0, X12 LTE connectivity, and more. 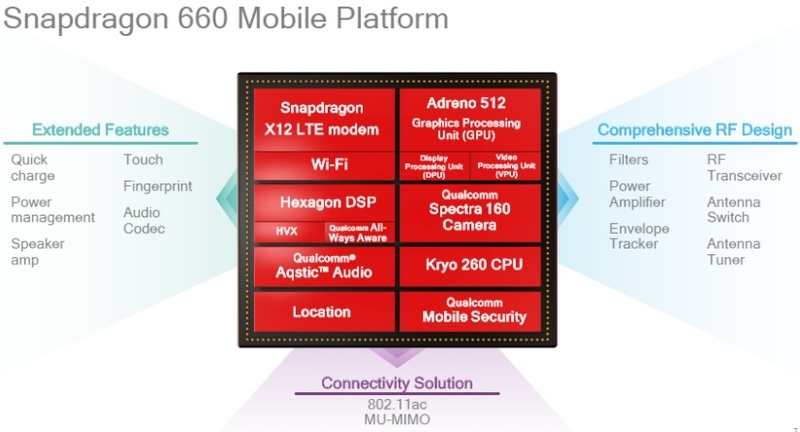 Qualcomm has just unveiled two new mobile platforms for mid-range handsets that improve the currently available Snapdragon 626 and Snapdragon 653. Dubbed Snapdragon 630 and Snapdragon 660, both are 14 nm chips and offer support for the Vulkan 3D graphics and compute API. The specs of both chips include a X12 LTE modem with support for data rates of up to 600 Mbps, Bluetooth 5, Quick Charge 4.0, as well as the Spectra 160 premium camera ISP with improved power efficiency and support for dual-camera setups and their features, such as bokeh, dual pixel autofocus, and more. According to the official press release, the Snapdragon 660 is already shipping, and the 630 will follow by the end of the month. The first products to use them should hit the market this summer.